Try to avoid water coming into contact with your panama, the toquilla straw absorbs water and when its left to dry it may leave a stain and leave the straw fragile. Do not leave your panama hat directly exposed to sunlight as panama hats need a little humidity to keep the straw in good condition. Handle your panama with care, avoid picking the panama hat up by the crown to frequently as this over time may lead to straw becoming weak over time. To clean your panama first try removing any marks with a dry cloth by gently rubbing it but if not successful try a facial or baby wipe that should remove most marks. 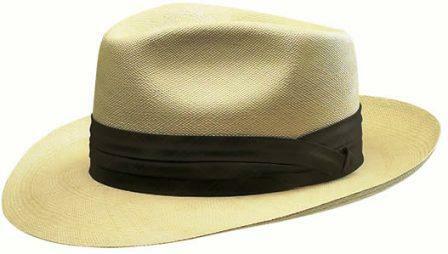 Contrary to popular belief, the true country of origin and manufacture of the panama hat is Equador. Paja Toquilla, indigenous to the coastal regions of Equador, is the plant from which panama hats are hand-woven by weavers whose skills have been handed from generation to generation. The plant comes from a tropical rain forest with the scientific name of Carludovica Palmata and only grows near the coast of Equador, their history can be traced as far back as the incas, who were the first to weave from the plant. Such hats were first observed in the 16th century. One very important feature of a panama hat is that every panama is unique. The weaving of a panama is carried out by ordinary country folk, its a unique skill that is handed down from generation to generation. These craftmen can produce a panama in one to two days, however the finest panama's can take up to five months to weave. 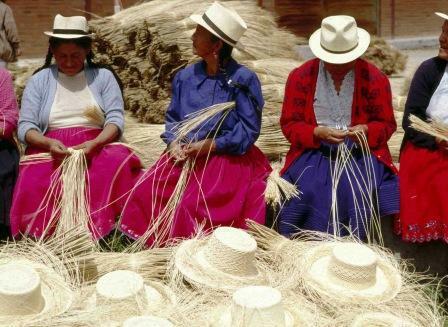 The two main processes of the panama hats creation, are weaving and blocking. The best way to determine the quality of the weave is to count the number of weaves per square inch. Fewer than 100 would be considered low quality and the rarest and most expensive panama's can have as many as 1600-2000 weaves per square inch. The actual quality of the weave is more important, a high count weave does not guarantee a well woven hat. A panama of the highest quality a "superfino" is said to be able to hold water and pass through a wedding ring. The finest quality panamas have a silky, creamy smooth texture in which the weave is berely perceptible, but when held up to the light a spiral of rings will be visable spanning out from the apex of the crown. These cocentric rings or "vueltas" indicate where new strands have been started in the weaving process, it is the number of vueltas that determines the quality of the panama. There may be up to ten vueltas in a cheaper more common quality of panama but in the finer quality you would expect to see up to twenty and in the very finest quality superfinos the number may be as high as forty. The second process is called blocking, this is when the panama is blocked into any trilby or fedora shape, but the most popular shape has always been the folder. >Back to the home page.